It’s always nice to have some easy dinner recipes on hand for those days when you end up with less time at the end of the day and don’t want to spend the majority of it getting dinner on the table (and cleaning up afterwards). Especially in the summer time — the kids are out of school, we’re trying to enjoy some slow summer days with fun activities together with friends or family — and we don’t want to stress about how everyone will get fed at dinner. Additionally, who wants to heat up the kitchen (especially here in Texas) when it’s already difficult to keep the house cool enough to be comfortable? Those long, refreshing summer days are perfect for planning ahead just a little and throwing ingredients in the crock pot for an easy dinner any day of the week. These recipes are also great ideas for taking to a potluck or your family reunion or to throw together at the lake for the day. Beef tenderloin strips cooked up with mushrooms and seasonings, with a little sour cream stirred in towards the end for a creamy delicious meal perfect for serving over brown rice or your favorite cooked pasta. With all the flavor of cabbage rolls and none of the rolling-up mess, browned ground beef is cooked up with cabbage, Ro-Tel, onion, garlic, and tomato sauce for a comfort food dish full of flavor. Braised chicken thighs are simmered in the crock pot with apricots, baby carrots and seasonings, topped off with almonds before serving; wonderful at the end of a long day with family and friends. Dish up this tasty meal of round steak, cut into strips, simmered with bell peppers, beef broth, onions, and seasonings; great for serving over mashed potatoes or brown rice for a yummy meal. The whole crew will enjoy these easy pulled chicken sandwiches; cook up the chicken breast pieces in the crockpot with buffalo wing sauce, ranch salad dressing mix, adding a little butter and cream cheese at the end for a rich delicious chicken filling for your favorite hoagie rolls. This dish turns out best if you only cook it on low for about 3 hours (not a dish you can let sit all day or it gets too soggy). But when cooked just right, it’s a fabulous blend of flavors with enchilada sauce, ground beef, onion, poblano chilies, taco seasoning, corn tortillas, black beans and corn. Top off with a dollop of sour cream, chopped tomatoes and cilantro. Make this dish either for breakfast (set it up the night before to cook overnight) or have breakfast for dinner, if you prefer. With sliced chuck steak, turkey bacon, diced ham and potatoes, bell pepper and onion, along with the eggs and cheese, this hearty breakfast casserole has ingredients everyone will enjoy. Serve it up with a bowl of fresh fruit for a complete meal. Chicken breast pieces cooked up with potatoes, carrots, celery, frozen mixed vegetables and cream of chicken soup; a creamy, hearty mixture that is delicious served over your favorite buttermilk biscuits or bread. Don’t let the idea of layering lasagna stress you out! 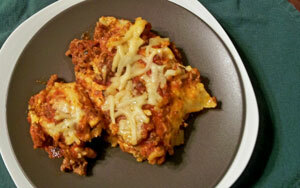 With this easy crockpot version, you can enjoy lasagna for dinner without all the intensive labor. 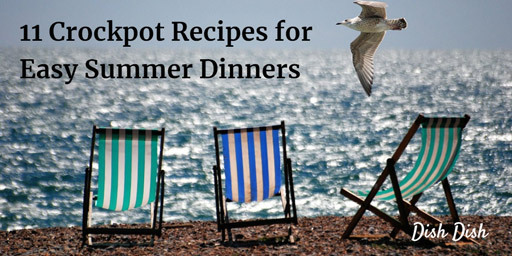 What are your favorite summer-time dinners or crockpot meals? Leave us a comment below and share your ideas with us!